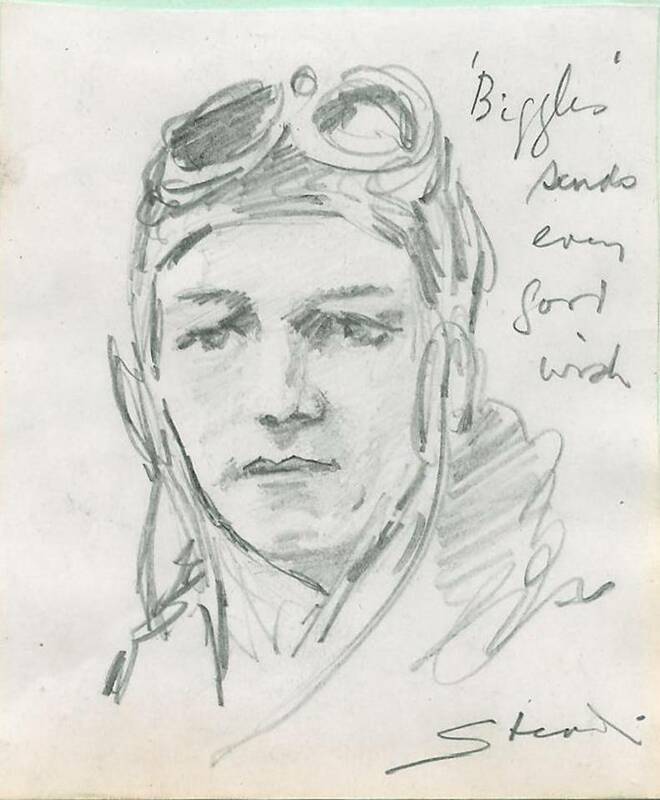 Leslie Stead was the great artist who illustrated most of the Biggles books following the death of Howard Leigh. I knew very little about him – not even how to pronounce his surname! Was it Stead to rhyme with “Bed” or was it Stead to rhyme with “Deed”? I set about trying to find out more. 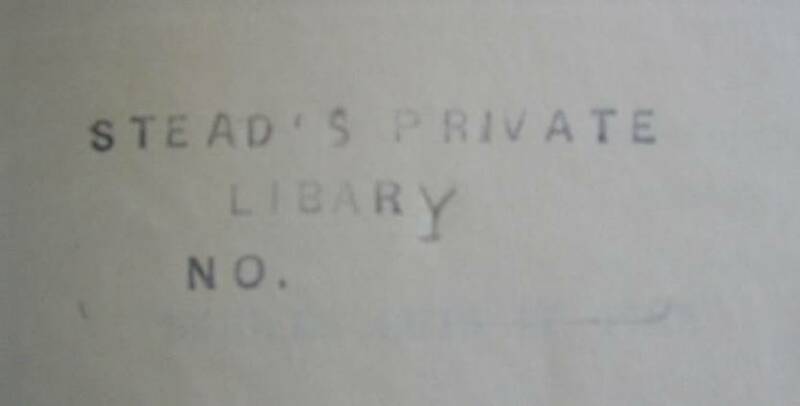 and stamped “Stead’s Private Libary No.” (Yes – the word “Library” is spelt incorrectly as it misses out the first “R”). I was then later e-mailed by Chris Stead, the Grand Nephew of Leslie Stead, and he put me in touch with his father Brian Stead. Brian was able to tell me a lot of information about Leslie Stead. Leslie was Brian’s Great Uncle. 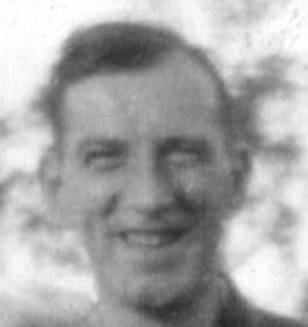 Leslie Stead was born Leslie Leonard Stead on 15th December 1899 in West Norwood and died on 20th August 1966 in Norbury. 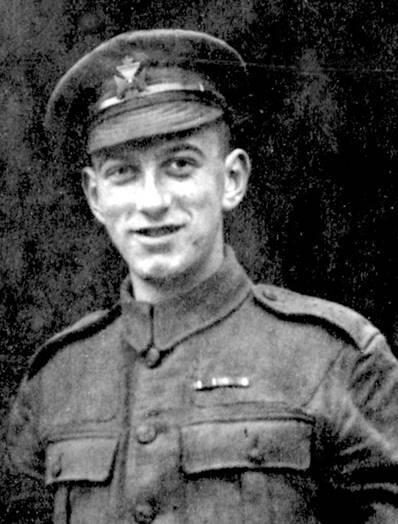 During the First World War he served as a Private in the Kings Royal Rifles. He married Beatrice Durrell in 1925. Leslie was one of eight siblings. There were six brothers and two sisters in Leslie’s family. Leslie was the youngest. He had three older brothers, Arthur, Sidney and Percy, all of whom were professional artists as well. His other brothers were Frederick and Alan. His sisters were Maud and Olive. 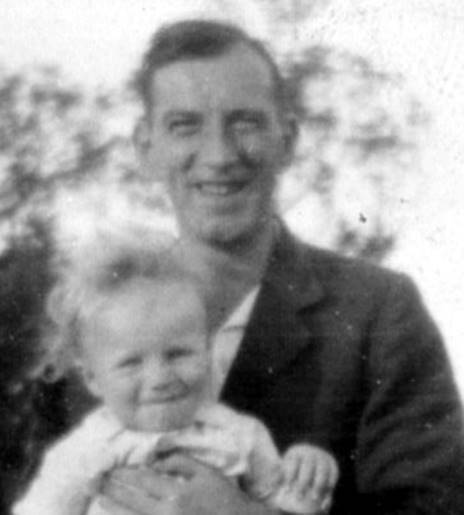 Leslie had one son, Michael Barrington Stead, who was born on 26th September 1926 and became a draughtsman in the nuclear industry. He died in 1996. Michael married Freda, who is also now deceased, and they had two children, Barbara and Graham, both in their late forties. If they read this, I would love to hear from them. And the most important piece of information I found out. It is a family story that Leslie Stead based Biggles’ face upon his own face! Here are pictures for comparison! As Leslie Stead died in August 1966, in tragic circumstances, following his retirement, what was the last Biggles book he himself illustrated? His work up to his retirement would have been published afterwards. The last Biggles book that had a coloured frontispiece was ‘Biggles Investigates’ published in October 1964. This was done by Leslie Stead. 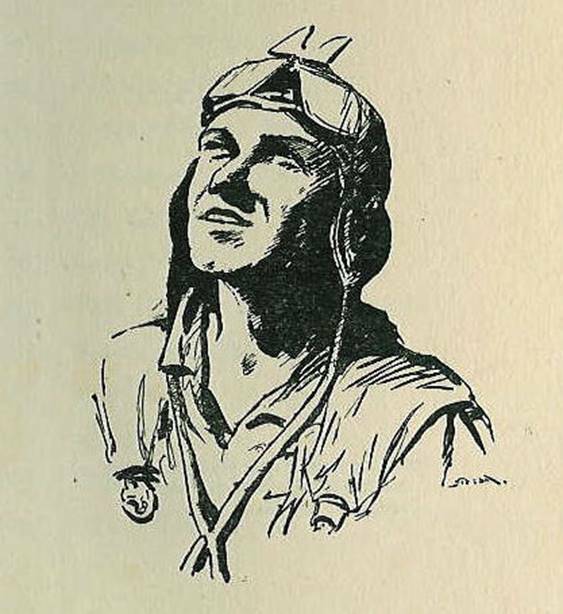 The last Biggles book that he did the internal illustrations for was ‘Biggles Looks Back’ published on 26th February 1965. After this, no Biggles book had any internal illustrations at all. 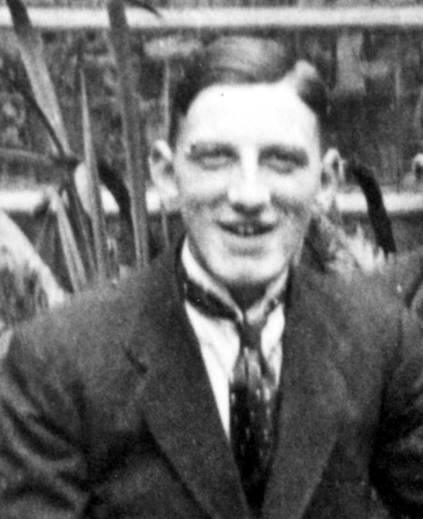 However, Leslie Stead was still doing the dust wrappers – it would appear up until his death. Biggles and the Plot that Failed – published in April 1965 – the book says on the inner dust wrapper “Jacket designed by Leslie Stead”. Biggles and the Blue Moon – published in May 1965 – the book says on the inner dust wrapper “Jacket designed by Leslie Stead”. Biggles Scores a Bull – published in August 1965 - the book says on the inner dust wrapper “Wrapper designed by Studio Stead”. Biggles in the Terai – published in February 1966 – the book says on the inner dust wrapper “Jacket designed by Leslie Stead”. Biggles and the Gunrunners – published in September 1966 – the book says on the inner dust wrapper “Jacket designed by Leslie Stead”. 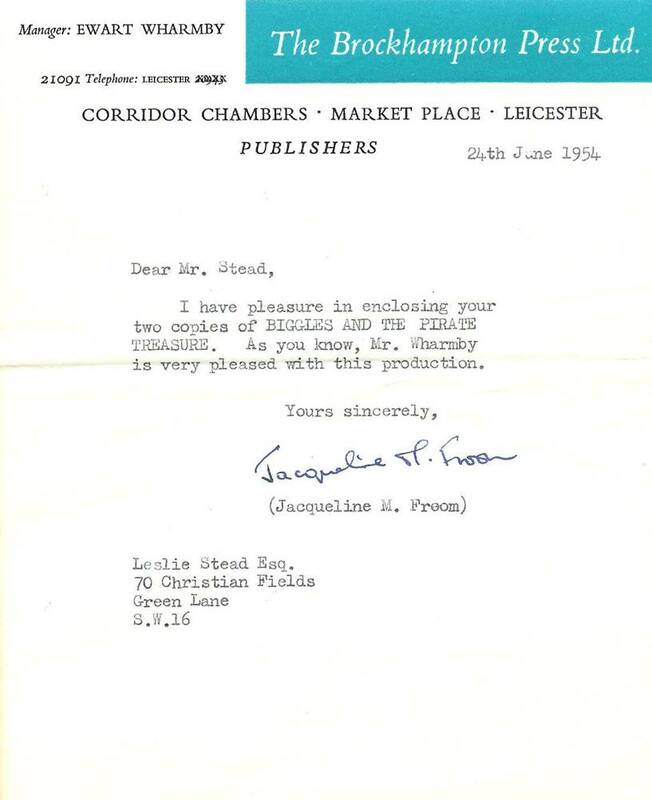 Biggles Sorts it Out – published in February 1967 – the book says on the inner dust wrapper “Jacket designed by Leslie Stead”. This was the last book with a credit for Leslie Stead. Stead himself – and he was always known as Stead – never anything less formal – TOM WARDILL and GEORGE CRITCHARD and a chap called Mick whose surname is not known. Biggles and the Dark Intruder – published as a paperback in April 1967 (the 1970 hardback used the same artwork). There is no artist credited. Biggles and the Penitent Thief – published in September 1967 – the book says on the inner dust wrapper “Jacket designed by Studio Stead”. Biggles and the Deep Blue Sea – published in February 1968 – the book says on the inner dust wrapper “Jacket designed by Studio Stead”. The Boy Biggles – published in March 1968 (and the last book published in W. E. Johns lifetime as he himself died in June 1968). This Dean & Son book cover was done by an unknown artist. Biggles in the Underworld – published in September 1968 – the book says on the inner dust wrapper “Jacket designed by Studio Stead”. Biggles and the Little Green God – published in March 1969 – there is no credit for any artist in this book. Biggles and the Noble Lord – published in August 1969 – there is no credit for any artist in this book. Biggles and the Dark Intruder – published in February 1970 – there is no credit for any artist in this book. Biggles Sees Too Much – published in July 1970 – there is no credit for any artist in this book. So Leslie Stead definitely did the cover for Biggles Sorts it Out – but did he do the cover of the paperback “Biggles and the Dark Intruder”? I would have said not, as that book cover is very much in the style of the later book covers. So who was the actual artist (or artists) from “Studio Stead” who did those later covers? It was either GEORGE CRITCHARD or TOM WARDILL, but probably the former. If anyone knows more, please tell me! Information from e-mails received in July 2012 and January 2016. This picture must have been drawn for a fan who wanted an autograph. I purchased this at auction. It is a page from an autograph book and the picture itself is quite small – the page only measures 3.5 inches by 5 inches. On the left is the original cover painting for “Worrals Flies Again” published in September 1942 and the first cover Leslie Stead ever did for a W. E. Johns book. On the right is the original painting for the frontispiece for the same book. Both are in my own personal collection. 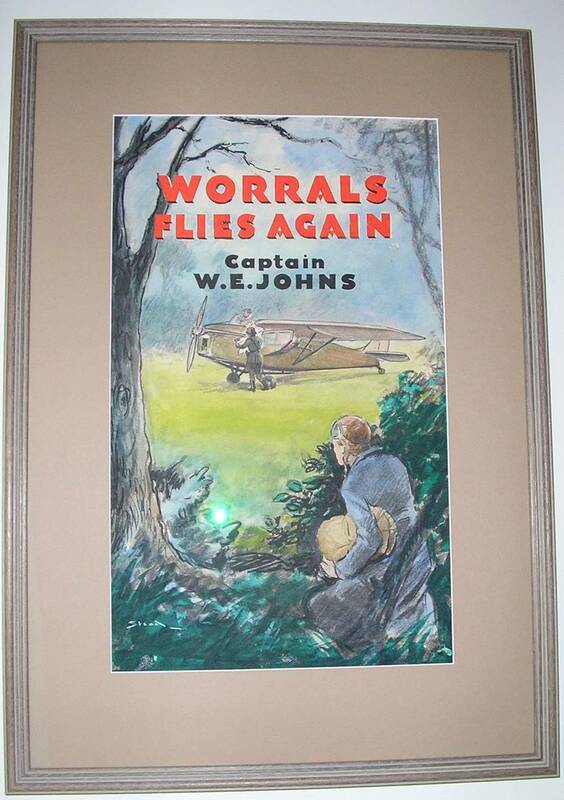 What is interesting is that the letters “Worrals Flies Again” are cut out and placed on top of the picture. It is the same with the propeller of the aircraft in the frontispiece. This gives a three dimensional effect. If you are interested in buying them.